Venture out of the city with trips to Epernay (Moet et Chandon Champagne Cellars, Avenue de Champagne, & more), Chateau de Pierrefonds (in Pierrefonds) and Chateau de Fere-en-Tardenois (in Fere-en-Tardenois). Dedicate the 1st (Sat) to wine at some of the top wineries in the area. There's lots more to do: contemplate in the serene atmosphere at Cathedrale Notre-Dame de Reims, do a tasting at Champagnes Pommery, admire the landmark architecture of Palais du Tau, and take an in-depth tour of Le Memorial de Verdun. 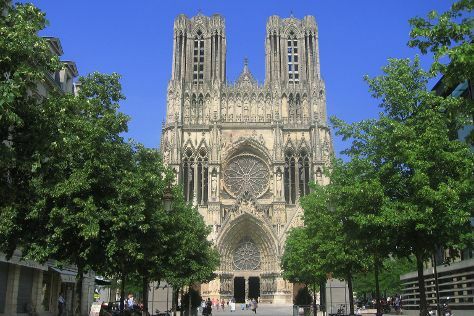 For other places to visit, traveler tips, and other tourist information, you can read our Reims trip itinerary maker website . If you are flying in from United Kingdom, the closest major airports are Charles de Gaulle International Airport, Paris-Orly Airport and Paris Beauvais Tillé Airport. Expect a daytime high around 27°C in June, and nighttime lows around 11°C. Wrap up your sightseeing on the 8th (Sat) to allow time to travel back home.